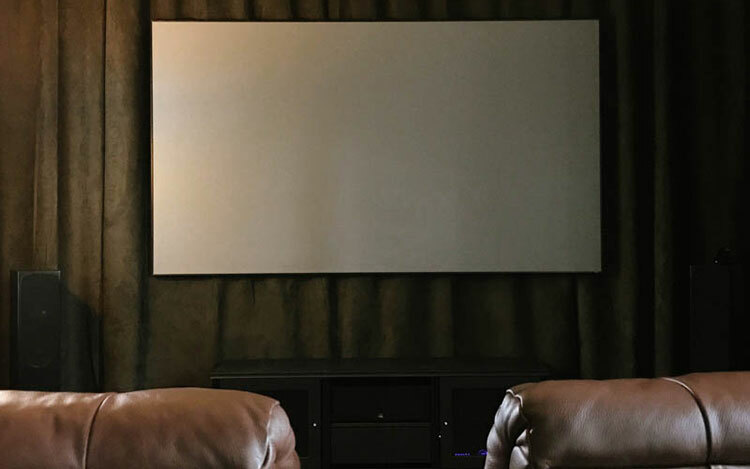 When building a custom home theater room, you have two different acoustic problems to deal with. One is reducing sound transmission levels from your home theater room to adjoining rooms, basically allowing the home theater to be enjoyed at higher volume levels without disturbing neighbors or house guests in other rooms and from the sound to enter Home theater. 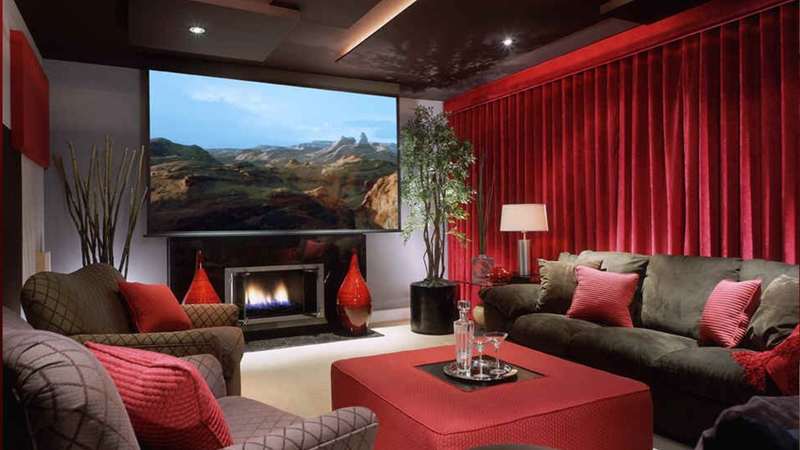 Home Theater Acoustic Curtain keeps outside noise from entering the room and reduces echo and reverberation in the room. Acoustic Curtains laboratory tested and field proven Acoustic Curtains and Acoustic Drapes protect you from outside noise, climate and light, providing maximum privacy. 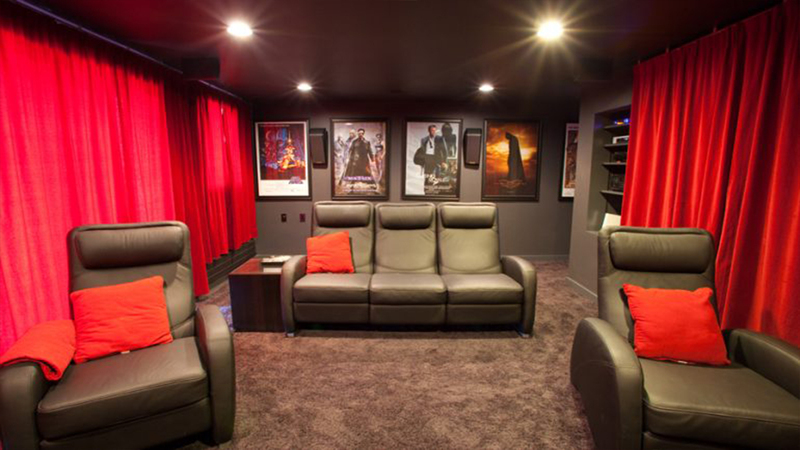 Joel in NJ, transformed his basement into home theater room but soundproofing traveling outside to adjusting rooms was an issue, basement home theater room yield optimal sound control given that the cement foundation has natural soundproofing qualities and room had double stacked drywall in the “room inside a room” concept. Gaps were also filled with noise-isolating materials. But had an issue to control the noise that travels around and through windows and stairway door. All Noise Control recommended most simple and effective way to soundproof a home theater room is by installing soundproof acoustical curtains to reduce reverberation and echo, as well as to reduce interference from outside noise. Acoustic Curtains can be used to cover windows and doorways or use as room dividers, which may be necessary in a split-purpose home theater/media room. Our acoustical curtains and drapes are designed with powerful, lab-tested inner linings that do the work in both residential and commercial environments. In fact, our STC 20 Quiet Curtains reduce noise by 20 decibels! For reference, that means the increase in decibel level from 10dB to 20dB is about 4 times as loud, which is a significant difference. Reducing noise by 20 decibels will help achieve your goals.